For this year's Character Animation Gallery, myself, Chris Sturgulewski, and John "Duze" Dusenberry collaborated on a piece of James Bond inspired art that we called "From Valencia With Love". 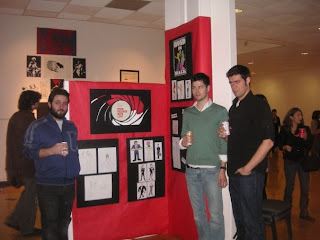 (Picture of all three of us next to our piece at the show above) Each of us did a group of drawings inspired by characters from the world of James Bond. Here is the logo from our piece and the drawings I did for the piece. Enjoy! Dude, I love these.. you guys did a really fantastic job! Sweet! You definitely captured the difference between Sean Connery and Daniel Craig. Funny thing is, Sean Connery's the one who is a former Mr. Universe. So, no Blofeld? No Mr. Bigglesworth?